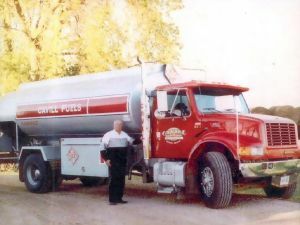 In 1969 Jim Cavill started working in the fuel delivery business under the tutelage of Alf Lang in Elmwood. In 1974 Jim became the agent for British Petroleum (BP) and established James Cavill Fuels. At that time the business was located in Elmwood, Ontario. One year later Jim and Bonnie Richards were married and together purchased the Cavill family farm, located just outside of Chesley. They started a family in 1978, when their daughter, Sarah, was born. Since that time the company has been involved in many community organizations and events, such as local baseball, 4-H, and the Chamber of Commerce, and also contributed medals and trophies for Minor Hockey at the year-end banquets. Bonnie and Jim were presented with the Volunteer of the Year Award from Minor Hockey, and Jim is a Gold Sponsor of the Hanover Barons. In addition, the Cavills have provided support for figure skating, the Chesley Agricultural Fall Fair, and local marketing media. Over the years Bonnie and Jim have participated in the Saugeen Antique Power Association, as well as other steam power shows. They also enjoy snowmobiling, camping, farming, and of course, spending time with their grandchildren. Jim still has customers that have been with the company since we started the business, demonstrating our commitment to customer service, as well as the quality of our products. Discover the difference for yourself when you contact us for service.